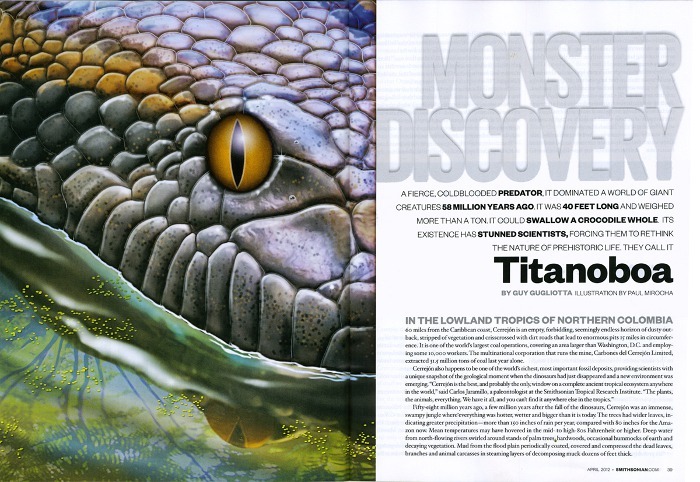 You can see my paint­ing of Titanoboa, the largest snake on Earth in the April 2012 edi­tion of Smith­son­sian Mag­a­zine. The biggest, at least as far as we know: it lived a safe 58 mil­lion years ago. When the edi­tor from Smith­son­ian Mag­a­zine con­tacted me with a rush job, they had tried pho­tog­ra­phy of a scale model of the largest snake in the world. But it just did not look real or threat­en­ing enough. A trop­i­cal snake, related to mod­ern boas and ana­con­das, Titanoboa was large enough to first crush, then swal­low the giant croc­o­diles of the day, only a cou­ple mil­lion years after the dis­ap­pear­ance of the Dinosaurs, 60 mil­lion years ago. Their lay­out called for a close-up to avoid any sci­en­tific con­tro­versy about the details of this pre­his­toric snake, recon­structed from a few fos­silized bones in a fossil-rich coal mine in Colum­bia. They wanted to focus on the eye, and the emo­tion gen­er­ated by the image of a snake as long as a bus. 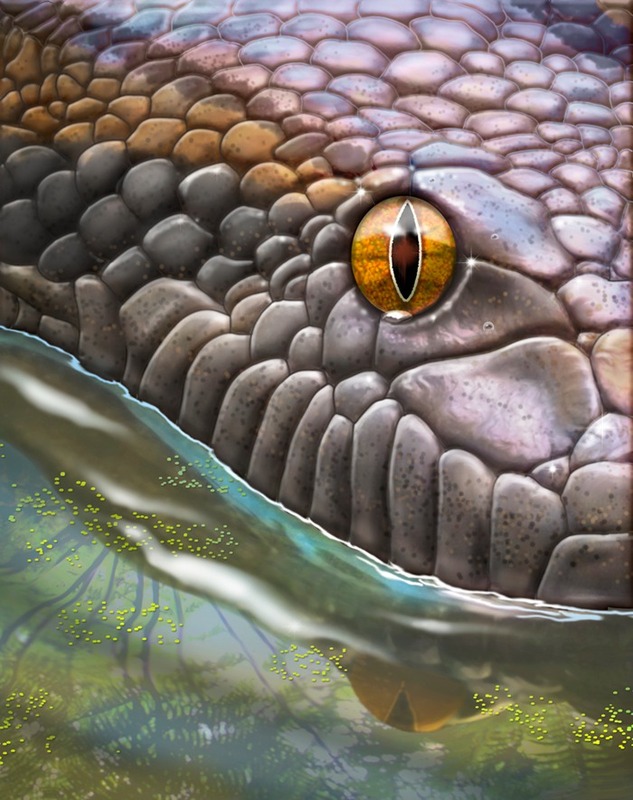 I decided to add men­ace by plac­ing the Titanoboa in the water, it’s prob­a­ble envi­ron­ment. The close-up direc­tion seemed to only enhance it’s mys­tery and hor­ror. I used ref­er­ence mate­r­ial of boas and ana­con­das, but since so lit­tle was known for sure about this giant snake, I was free to engage in a lit­tle informed fantasizing.